Summary: Francis is living his dream, working as a shoemaker on the outskirts of the jungle. He uses the finest coconut wood for the soles, goats’ wool for extra padding, and wild tiger grass collected from his friend Nigel the squirrel monkey to weave into fabric. 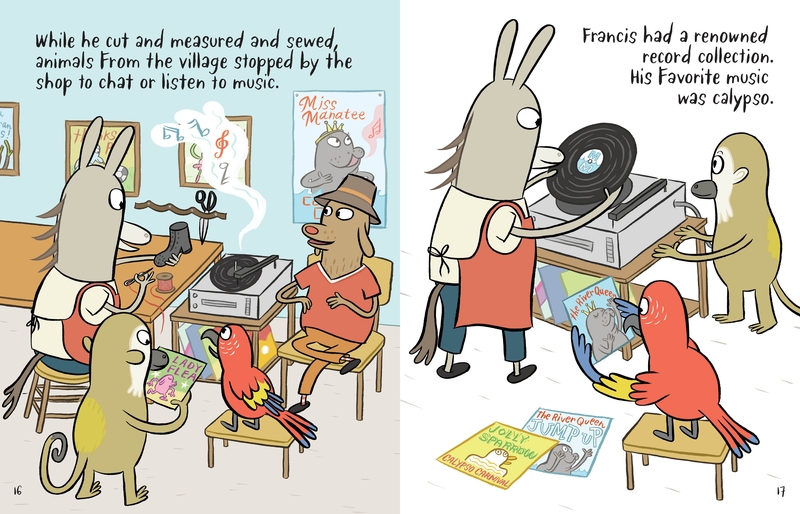 When he gets a rush order for famed calypso singer Miss Manatee, and Nigel is nowhere to be found, Francis decides to venture into the forest himself. Clearly leaving his comfort zone, Francis eventually finds the tiger grass, resolves a darker side of Nigel’s personality, and meets some new types of animals who become friends. Upon his return, he comes up with an innovative way to create shoes for Miss Manatee (who, it turns out, doesn’t have feet), and works with his old and new friends to help her make her dry-land debut. Includes photos from Guyana, the real-life inspiration for Francis’s home. 208 pages; grades 1-4. 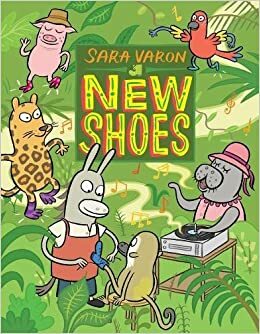 Pros: This graphic novel combines the best of the picture book and chapter book worlds, with a big cast of fun and funny characters, an interesting story with chapters, and lots of engaging artwork. It was an extra treat to see the photos of Guyana. Sure to be popular with the newly independent reading crowd. Cons: I worried that the “downstairs chickens” who wove the wild tiger grass into fabric could be experiencing some unfair labor practices.